High school students who plan to major in one of the degree programs in biological sciences should complete at least three years of college preparatory mathematics (two years of algebra and one year of geometry), and one year each of chemistry and biology before entering the University. A fourth year of college preparatory mathematics (to include trigonometry) is strongly recommended. 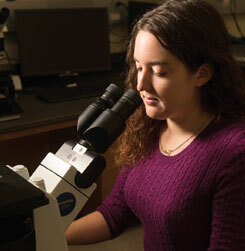 Admission to a degree program in biological sciences requires an application for a major and acceptance by the department. Once admitted, students are formally affiliated with the department and assigned an academic advisor. Advisement is mandatory. Majors are permitted to register each term only after their Course Request Forms have been approved by an academic advisor. Students are encouraged to select their major field of study early in their academic careers to ensure orderly progress toward meeting degree requirements. To be admitted, students already enrolled in the University must have a minimum grade point average of 2.0 in completed science and mathematics courses, as well as a cumulative grade point average of 2.0 or higher in all courses taken at SIUE. Transfer students should have a 2.0 grade point average in science and mathematics courses taken at other colleges and universities.